Like any geek, I made some quick calculations of how many miles that I would need to run in order to reach the target and quickly arrived at the conclusion that it would be a piece of cake so signed up immediately with great conviction. One thing a spreadsheet will never tell you is that you may miss your weekly quota of runs due to bad weather, illness or holiday and this means you will need to double up to catch back up again but despite any miscalculations, I remained faithful to my promise and finally completed the challenge by the skin of my teeth on the 29th December. I left the house with 8 miles left of my challenge today thinking shall I do a 5+3 or 4+4 this week to finally put this long challenge to rest. The whole run consisted of me arguing with myself and ended up doing the full 8 miles which further proves that running really is 98% mental and 2% physical. 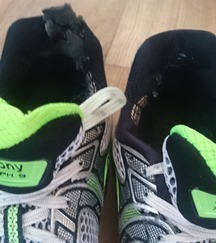 With the challenge complete, my 2nd pair of trainers Saucony Power Grid Triumph 9 are looking a little worse for wear as the backs have completely disintegrated after 600 miles so the search for my next pair begins now. With 3 years running under my belt, I am still amazed that someone such as myself who previously hated gym culture and exercise now actually misses the thrill of nipping out for a quick run armed only with a pair of trainers, my thoughts and a music playlist to fit my mood if I go more than a week off the road. I am never going to win any speed races but just like the old saying goes “No Matter How Slow You Go, You’re Still Lapping The Guy on Sat On His Couch” so I guess the only questions remaining are what is next year’s goal? and Did Martin Lewis complete the running challenge?